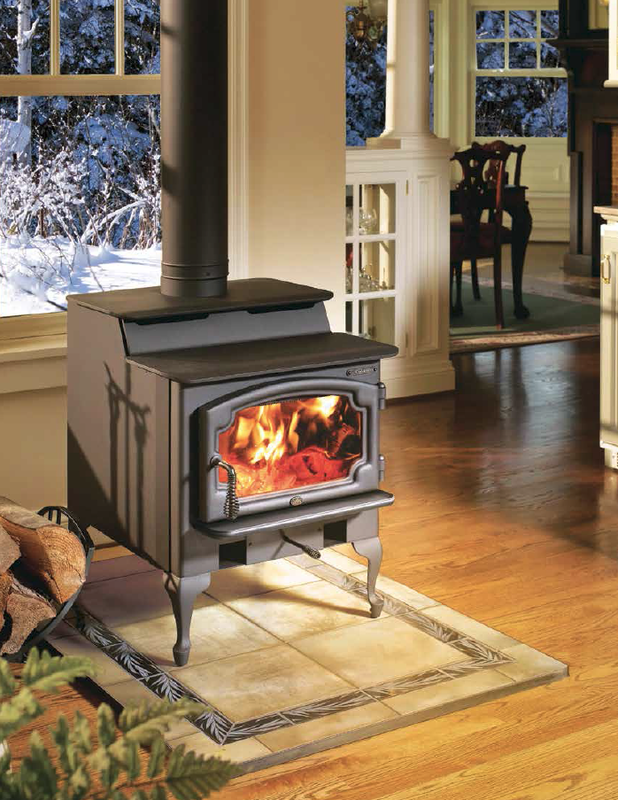 The Republic™ 1250 is the perfect choice if you’re looking for an economy-priced stove that produces great heat. This stove is ideal for zone heating in mobile homes, cabins and small to mid-sized living areas. With the Republic™ 1250 you get no frills added – just beautiful, efficient heat. This stove also features a large cook-top surface and has the choice of decorative legs or a pedestal. Alcove and Mobile Home approved. 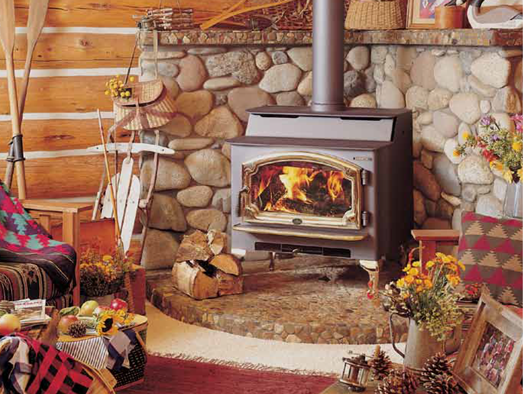 Did you know an old, inefficient wood stove can generate as much as three pounds of pollutants into the air each day? Lopi stoves are EPA certified and emit as little as 1.9 grams of particulates per hour, thus reducing pollutants by over 95%. By using a Lopi stove, you’re keeping the air in your neighborhood clean and breathable. And while wood is a renewable resource, Lopi stoves are so efficient they use substantially less wood than other stoves to get the same amount of heat output. The Republic 1750 wood stove offers the classic Lopi look – a radiant surface for cooking and a convection surface for warming, and it packs a powerful punch. It may be small, but the compact Answer’s size belies its incredible heating capacity. The Answer uses a five-sided convection chamber to distribute heat evenly throughout your home. Cool room air is naturally drawn around the hot firebox, heated, and returned back into the room without using a blower. The Endeavor™ is Lopi’s #1 selling wood stove because it combines form and function with an unbeatable heat transfer system. This stove is ideal for heating medium to large sized homes. It features one of the cleanest-burning fireboxes of any mid-size stove at 1.9 grams per hour. Its firebox is also deeper than most and can accommodate logs lengthwise, up to 18” for longer burn times. 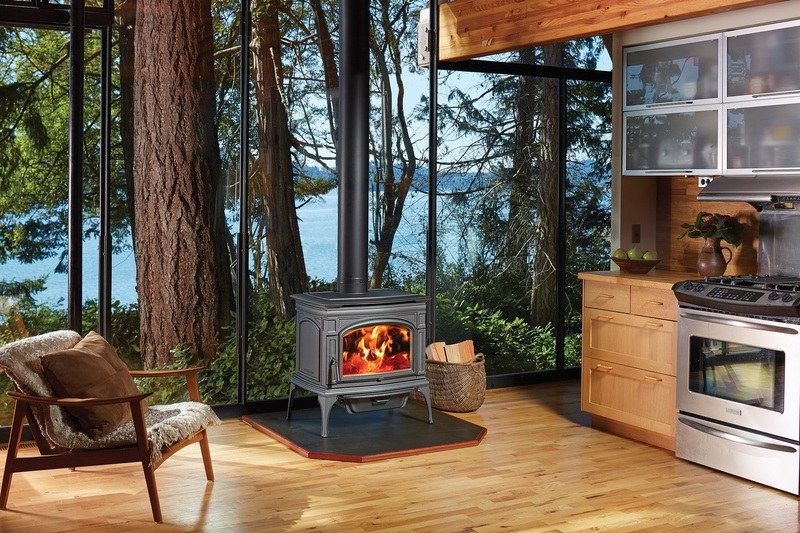 The Endeavor™ also offers the closest clearance of any wood stove in the industry – as close as four inches to a rear combustible surface. In addition, a bypass damper makes startups easy and prevents smoke-backs during reloading. Nothing heats like real wood. Lopi wood stoves and fireplace inserts warm the coldest days, brighten the darkest nights and fill your home with the gentle, radiant heat only wood can provide. The Liberty is the largest stove made by Lopi. At only 2.6 grams of emissions per hour, it is also the leanest-burning large stove every approved by the EPA. 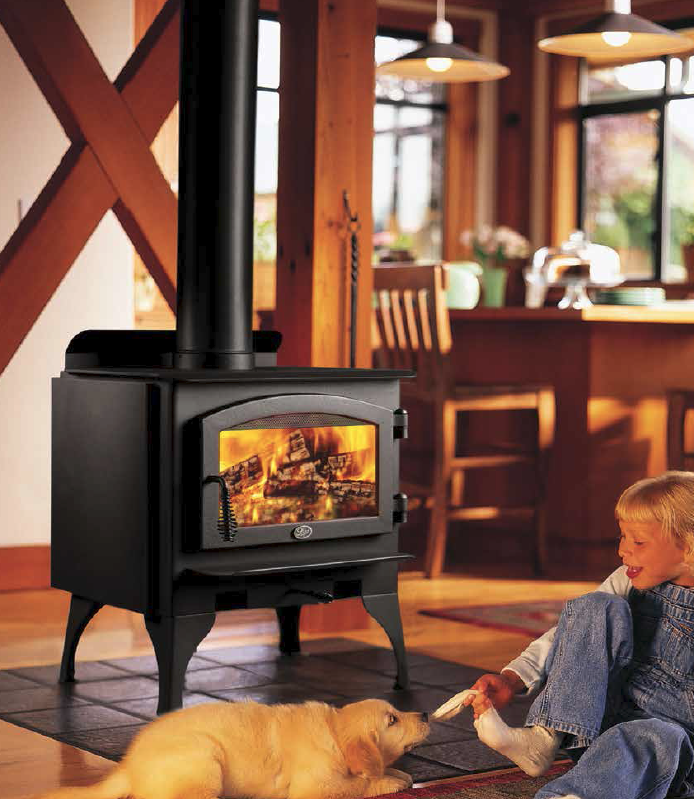 The Liberty has the biggest firebox of any large stove, which accepts 24” logs. It also features a single control to adjust air flow, making it easy to achieve burn times up to twelve hours long. The Liberty’s step-top design is enchanting yet functional, providing cooking and warming surfaces as well as radiant heat. 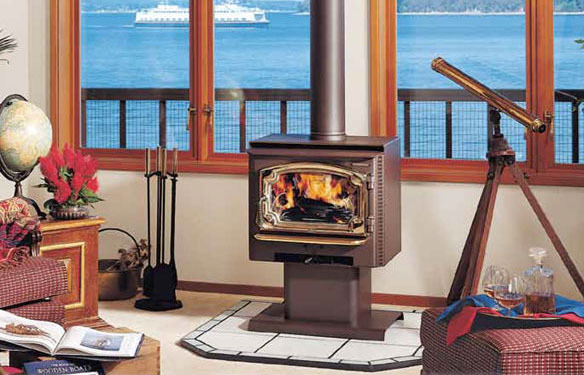 The Cape Cod™ is Lopi’s “Super Stove”, shattering all performance records for wood heat! Boasting an 80% overall efficiency* and EPA 0.45 grams of emissions per hour, the Cape Cod™ is one of the cleanest burning wood stove on the planet. This innovative game changer of a wood stove features a massive firebox and convection heat exchanger, all wrapped up and presented to you in an elegant package of cast iron beauty and durability. This stove provides both radiant and convective heat, a feature that is not offered in most cast iron stoves. It is 20% more efficient than a typical wood stove, burning less wood and producing more heat. The Cape Cod™ not only delivers, but excels in every category. 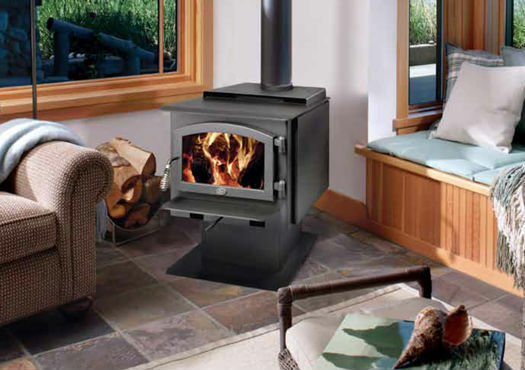 For over 35 years Lopi has been the wood stove of choice for those seeking performance, function, and design. The mid-sized Evergreen hits the mark in all three categories. 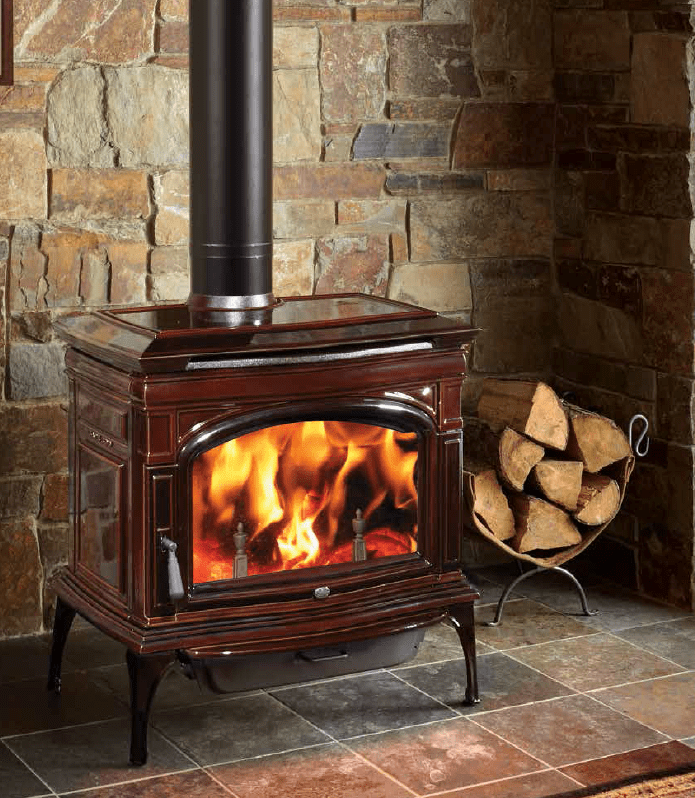 This sleek wood stove with its gentle curved lines complements any home’s décor while artfully presenting heavy gauge steel Unibody construction and a cast iron door. The result is exquisite and reliable heating for decades to come. With the standard bypass damper we’ve given you full control over the flow of smoke inside your Evergreen. Gone are the days of a smoky house during startups and reloads! Simply open the bypass via the pull ring located just above the door to draw smoke away from the door and up the chimney. Close the damper to drive smoke around the baffle and initiate the efficient secondary combustion process (more on this below). Your burn rate, from a mellow overnight burn to a large rolling fire, is effortlessly managed by a single air control knob found below the stove’s door. Combine that heat output with the cook-top surface to warm up the perfect bowl of soup during a power outage. The Rockport by Lopi combines beautiful European castings with optimum performance and solid construction to bring you the perfect mid-sized wood stove. Premium materials like iron, steel, real masonry brick and crystal clear ceramic glass are brought together in a fusion of classic elegance and durability designed to heat your home and family for years to come; even when the power goes out. 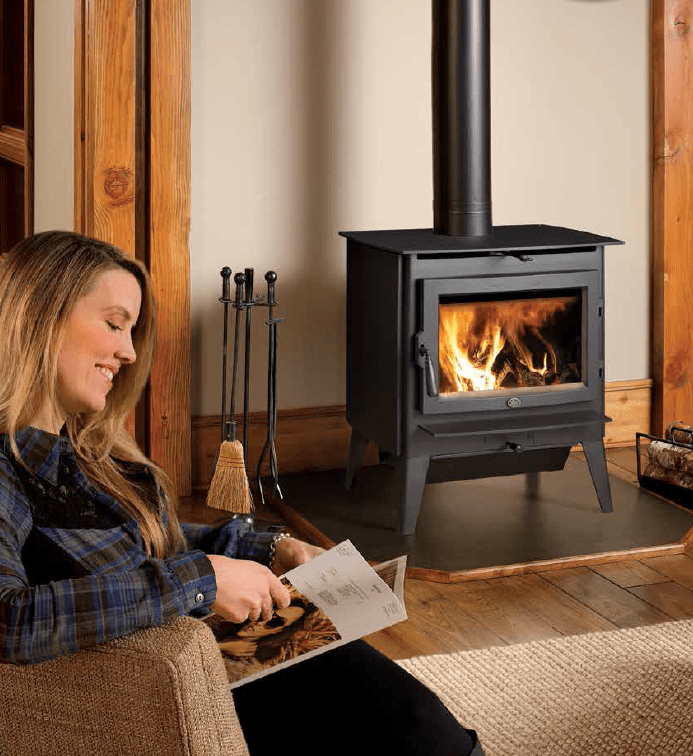 The Rockport features revolutionary patented Hybrid-Fyre technology, making it one of the cleanest burning and most efficient wood stoves in the world.